JFH (John DiBiase): You've lived this story, you've recalled it many times over the years at speaking engagements and in personal conversations, interviews, etc, and now the book you wrote about it [has been] re-released and the feature film is about to hit the big screen - how does it feel to see this story take on such a fruitful life of its own? JFH (John): How does seeing your story play out in front of you in the film feel? Does it ever spark déjà vu when watching it? How much do you feel Renee (Zellwegger) captures what you remember about your wife, Debbie? Ron: Yes, there are many deja vu moments for me in the film. Some very happy ones and several quite painful. I admit that it's strange to see actors using our family names and recreating scenes that happened in real life. I feel Renee captured the essence of Debbie very well as she only had still photos and my recollections to learn about her. She took the role very seriously as she consulted with me daily to make sure she portrayed her character accurately. JFH (John): How much of a say did you have in the casting of the film? Did you personally select Greg Kinnear to play you? Ron: I was very involved in the casting of the film as I was the only living person who knew everyone. JFH (John): How closely did you work with Greg (Kinnear) to make sure he represented you correctly? Ron: I personally selected Greg Kinnear to play me in the film. But it was Mary Parent, our lead producer from Hollywood, who closed the deal. JFH (John): Djimon Hounsou's portrayal of Denver is incredible! How do you feel he captured your real-life good friend? Ron: Yes, Djimon's portrayal of Denver was incredible. Considering that Denver was quite a bit older and with a different accent, I was skeptical until the camera started rolling. Seeing Djimon in action, I realized he is one of the greatest character actors of all time. He "nailed" it!! JFH (John): Can you share a favorite moment or experience you had during the filming of the movie? Ron: My favorite moment was when our director, Michael Carney, shouted "it's a wrap! ", and I knew we had a great film in the can. Immediately, Djimon thrust his hands in the air like a fighter who had just won a heavyweight championship. The euphoria of that moment will stay with me forever. Luckily, I captured his radiant smile on my iPhone. JFH (John): Do you have a favorite scene in the finished film? Ron: My favorite scene is what I like to call "cinema magic." Near the end on the film, Debbie and Denver sat next to each other on a dilapidated sofa against a burned-out building near the mission. For nearly a minute there were no words spoken as they both realized the next time they would see each other would be in heaven. JFH (John): Can you say, at all, why the film's release was delayed for so long? Ron: Boy, that's a LOONNGG story. But, the short version is that it is being released in God's perfect timing. Ron: Yes, the soup kitchen, where we filmed our mission scenes, was completely remodeled at a cost of nearly $500,000. This money did not come from our production budget but from the generosity of our friends. It was a gift to the homeless community of Jackson. We were disturbed by the condition we found it in and didn't have the heart to leave it that way. JFH (John): Have your kids, Regan and Carson seen the film? How did they react to it? Ron: Yes, they both have seen the film and are very proud of it. However, it only depicts two years of our lives and the closeness we shared as a family is not fully portrayed on the big screen. JFH (John): What do you hope people take away most of all from the book and film? Ron: My greatest hope is that people will begin to see the homeless through the lenses of God's eyes and be willing to show some love to the unlovable. Also, I hope it's a call to action for people to get involved in making a difference in their communities. JFH (John): I heard you have a follow-up book that will be more about your time with Denver after Debbie's passing. Could you tell us a little about this book? Is it sort of a "Same Kind of Different as Me 2?" or is it more of an expansion of the story, but in a different storytelling style? Ron: The new book titled Working Our Way Home is a continuation of our story Same Kind Of Different As Me. it begins with Debbie's death and ends when Denver joining Miss Debbie in Heaven 11 years later. It's told in the same style with alternating chapters, one in my voice and one in Denver's. I jokingly say we were the real "Odd Couple" with a calling to change the world. JFH (John): Thanks so much for taking the time to talk with Jesusfreakhideout.com. Do you have anything else you'd like to add? Ron: There's nothing I would like to add. Thanks for this opportunity. 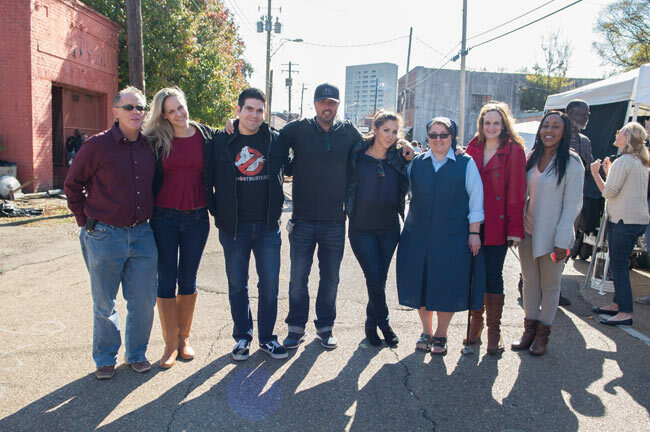 JFH's John DiBiase (third from the left in the Ghostbusters t-shirt) with other media and Same Kind Of Different As Me director Michael Carney (fourth from the left in a cap) on location in Jackson, MS, on November 21, 2014. 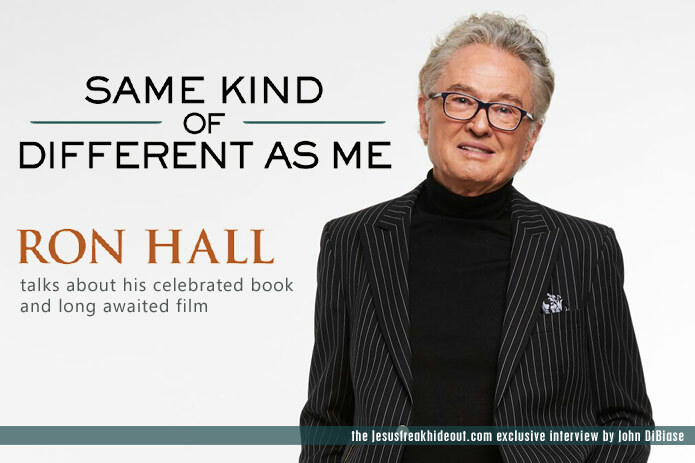 Ron Hall's story Same Kind Of Different As Me is available now wherever books are sold. 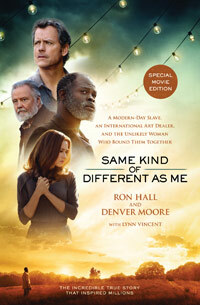 The film version of Same Kind Of Different As Me releases October 20, 2017!